January 13, 2018, was filled with special moments like the ending to Mitchell’s speech, as Rhodes and the Memphis community officially installed the college’s first female president – and the first of Jewish faith. And although the inauguration of Dr. Marjorie Hass fell on a day of ice, snow, and freezing temperatures, the crowd that braved the cold will remember the warm moments inside the Bryan Campus Life Center. And then, of course, there was the moment when Dr. Hass stood at the podium. “I stand before you in joy and gratitude, humbled to be at the center of this morning’s activities,” she began. Dr. Hass spoke to the core strengths of the college, and highlighted her commitment to the future: to offer an education fit for future world changers, grounded in face-to-face relationships, that supports the spirit, and that remains relevant and accessible to the students of tomorrow. To that end, she announced a yearlong strategy process to bring forward the best ideas to meet these ambitious objectives. A Strategic Planning Committee and working groups have already been formed to examine questions relevant to the future of the college, including student body size and composition, new programs and revenue, and the campus boundaries and space. These committees will also consult with alumni, parents, and friends of the college to gather their expertise. In addition, Dr. Hass unveiled two new projects already underway to support the college’s core commitments. The first: a new master’s degree in urban education program launching this spring, with its first cohort beginning the intensive 15-month program this summer. With a unique curriculum that will incorporate state-of-the-art research and hands-on learning, the program will produce 100 teachers annually, each equipped to make a difference in the lives of Memphis city schoolchildren. Dr. Hass then announced plans to greatly increase Rhodes’ investment in community partnerships, made possible by a transformational gift from a Memphis family. The newly named Lynne and Henry Turley Memphis Center will focus on urban education, the arts and social change, neighborhood and community development, and youth empowerment and justice in our community. Following the inspiring inauguration, the reception was a festive affair. Conversations centered on the excitement and hopefulness felt by the faculty and guests, as Dr. Hass exchanged warm greetings and chatted with her guests. 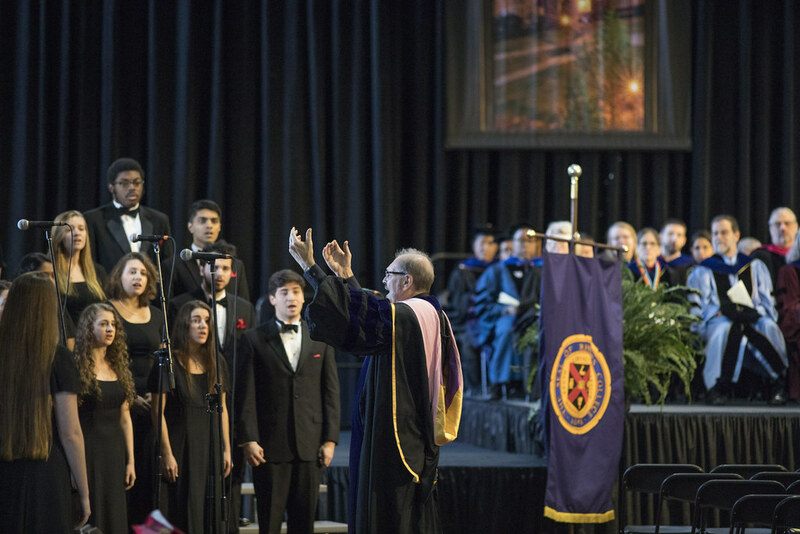 Chairman of the Board Dr. Cary Fowler ’71 presided over the inauguration. In spite of the lingering cold and icy weather, Dr. Fowler greeted guests that included representatives of colleges and universities from Memphis and from across the country. More than 50 Memphis community partners were represented, including City of Memphis Mayor Jim Strickland and U.S. Representative Steve Cohen. A special welcome was extended to the 19th president and first lady, Dr. William Troutt and Carole Troutt; and the co-chair of the Presidential Search Committee and former Board of Trustees chair William Michaelcheck ’69. The President’s family was there to support her—the very first “first gentleman” of Rhodes College, Dr. Larry Hass, their children Cameron and Jessica, and her parents, Drs. Mike and Sally Hoit. The Rhodes family—faculty, staff, student, and alumni—was also there to witness the historic occasion. Events leading up to the formal inauguration ceremonies included “Open Windows on Academic Life,” featuring faculty presentations on subjects ranging from Michelangelo’s David to immigration to health disparities. Student sessions highlighted artistic expression, including voice, instrumental performance, and visual art. Student research, internships, and fellowships within the Memphis community and on mentored academic student scholarship from programs across the campus was presented, while poster sessions lined the first floor corridor of Robertson Hall. A festive lunch celebration featured local restaurants, from barbecue to sushi to MemPops. President Hass moderated “Windows on the City,” a panel that included President Michael J. Sorrell of Paul Quinn College in Dallas; President Elizabeth Kiss of Agnes Scott College in Decatur, GA; and President John Smarrelli of Christian Brothers University in Memphis. The lively discussion centered on the impact that liberal arts colleges have on their cities and the ways in which the city fosters teaching and learning. Click on the photo below to view an album of inauguration events.